As time goes by and the world continues to modernize, we are definitely pleased with the continuous evolving of our futures. With every moment in life as it changes, there seems to be a part that we all tend to take for granted and that is our heritage. Our legacy, our pride, our hope… these are priceless virtue that can never be forgotten as it will lead us to be who we are one day. Yes, traditions are hard to keep and yes, there are just so many dos and don’ts in many cultures but that is what it is all about, isn’t it? That is what makes our heritage unique and shape us to who were are today. No, this is not a lecture to all but it leads me to share with everyone a timeless experience I had recently. Truth be told, I was ignorant of my own heritage till I reach my early twenties. Then I became really curious and found out that my dad is a baba while mom is not. I proceeded to literally interrogate my mom about our heritage and soon, I was hooked. Proud to be part of the Nyonya and Baba heritage from the northern part of the country, I make sure to learn up all the aspects of the cuisine and also some of its dos and don’ts. After all, it is where I came from and my parents came from and also, it builds me to who I am today. When a recent invitation came to experience a true blue traditional Peranakan mock wedding and Nasi Kemuli Tok Panjang Luncheon, I jump on this happily. These days, it’s almost non-existence to attend a traditional Peranakan wedding. I was super thrilled. I knew this was going to be once-in-a-lifetime experience. 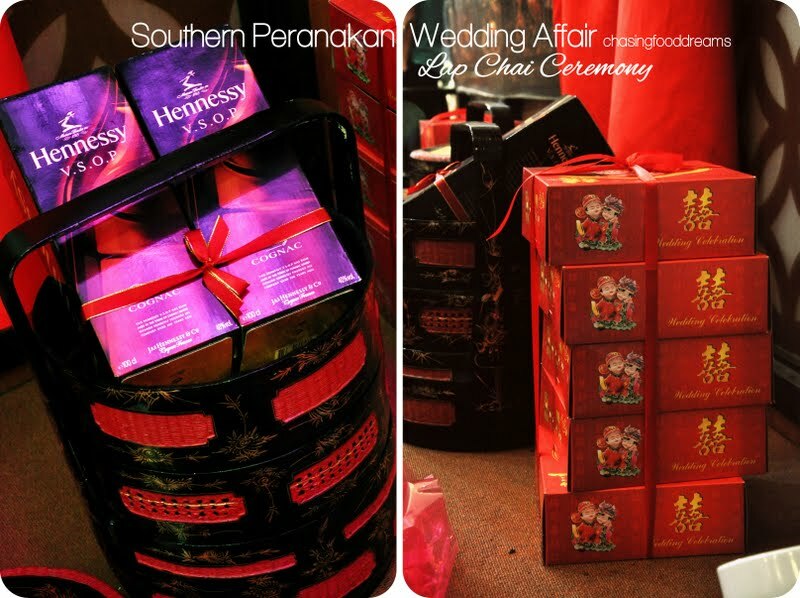 In conjunction with a year affair if Majlis Kahwin 2013, this year, a Southern Peranakan Wedding affair was hosted by six-generation Peranakan, Cedric Tan who hails from Malacca and a Nyonya Chef Debbie Teoh, whose repertoire of Northern and Southern Peranakan cuisine is vast and much admired by many. Both Cedric and Debbie believe that it is essential to share the knowledge and heritage of an almost dying tradition, to ensure that many more years will be passed on to the new generations. With this said, I would like to share the experience through my lens and through my words of what a Southern Peranakan Wedding and its cuisine is. The event was held in Kuala Lumpur Craft Complex late June this year. 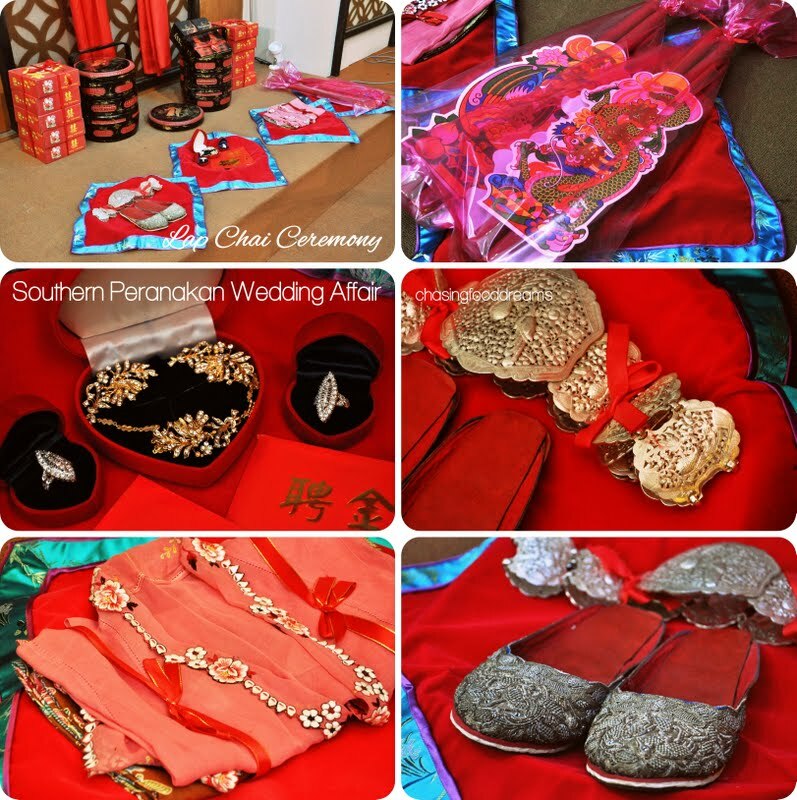 Tradition dictates that a Peranakan wedding be held for 12 days. There is quite a list of rituals that is essential to the ceremony and we were treated to a condensed version with a few crucial rituals. 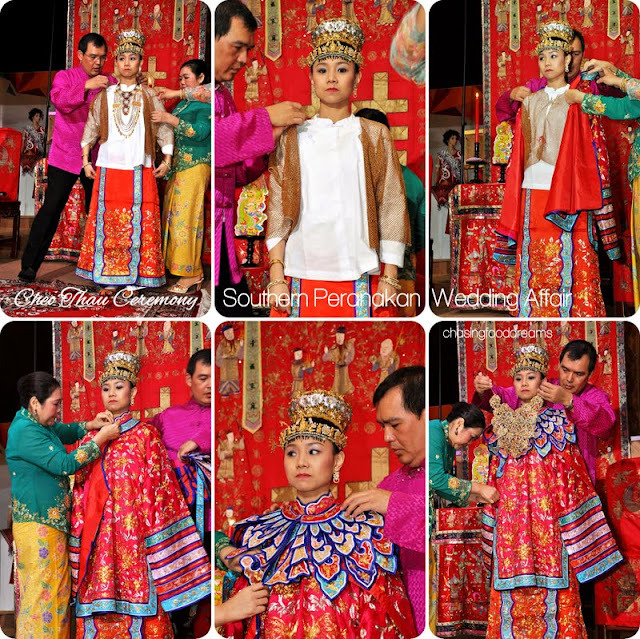 A Peranakan wedding is always elaborate and grand, it is also very colorful and is filled with many details. 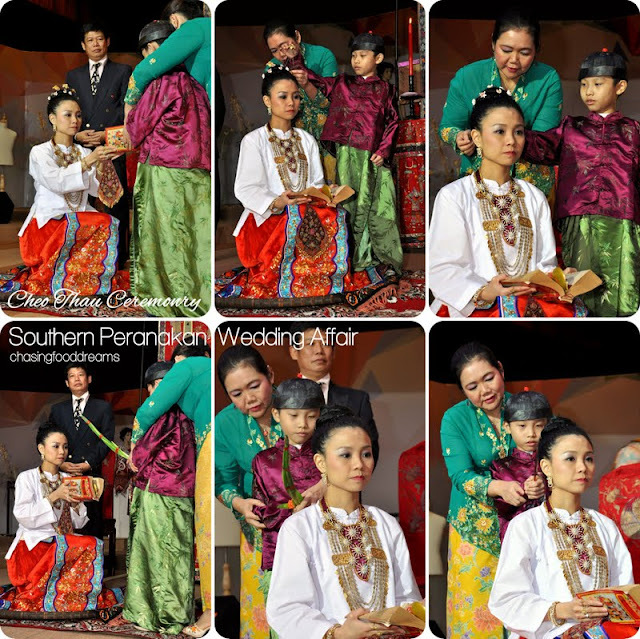 Someone even quoted that one often tells how rich a family is by their Peranakan wedding ceremony. The wedding ceremony is expensive and there is no limit to what one can show off in the ceremony as you can certainly buy the very best and go for more elaborate wedding costumes, jewelry, physical things and so forth. The ritual began with presentation of both birth certifications Sang Jit. Then it was Lap Chai, the ceremony of exchange of gifts between the families of the bride and groom takes place a few days before the actual wedding ceremony. The groom would arrive at the bride’s family to present to them a list of specific items to be considered as gifts. To some, this day also often said to be the engagement day for the couple. The bride’s family would also return of the items or replace them with similar items to the groom. Even a portion of the dowry may be return depending on the families. It’s a long ceremony and starts from morning till evening. After the Lap Chai ceremony, there is the Ann Chng ceremony where both families would gather at the bride & groom’s new house. It is the day to setup the bridal bedroom chamber and a whole long list of items and procedures follow. Cedric was present the whole time with a special emcee to present the whole ceremony and its rituals. In between the various ceremonies, we had a special break to participate in an interactive programme featuring Hari Kupas Bawang, Hari Tumbok Tepong and Hari Ann Chng. These rituals are performed after the Lap Chai ceremony where everyone from the village would gather to help out with the wedding rituals and feast. We saw how fine the knife skills of a Nyonya is and how everything is clearly done by hand from peeling shallots to all the fine slicing. There is even a part of a Nyonya selecting every grain of rice for perfection! Cedric also demonstrated the art of Chinese Paper Cutting where red paper is cleverly cut to shape intricate beautiful designs to decorate the bowls for prayers and as decoration for the ceremony. Cheo Thau is known as the hair combing ceremony. This is a crucial ceremony where the bride goes through a ritual to symbolize her transitioning from childhood to adulthood. The ceremony is fairly long and the bride goes through a beautiful long process from the very beginning to the changing of the wedding costume and all other rituals. She is assisted by her parents and a Sang Kek Em (a female wedding consultant or mistress of ceremony who is very familiar with all the rituals). Before bride ritual starts, the family of the bride starts with prayer rituals by lighting up the candles placed on a special altar known as Sam Kai. This is called Pasang Lilin. The Sam Kai is dressed with an embroidered cloth and has quite a few items placed on it. Bowls of fresh fruits, sugarcane, dried fruits, red dates, rock sugar and more all nicely dressed with intricately cut red paper. The centerpiece of the table is a special wooden box called Chanab that has skewers of flowers and fruits as offering for the ritual. Tea is poured and everyone proceeds to light up joss sticks and send prayers to the God of Heaven and their ancestors. Once the prayers are done, the bride will kneel and Sohjah to her parents as respect. The bride prepares for the Cheo Thau ceremony by wearing white and some simple jewelry. She is then asked to sit on a Gantang (a rice funnel) covered with cloth and placed on a Nyiru (large rattan tray). Here is where her transformation starts! She must sit in an orderly manner with her hands placed daintily. Her hair is also donned up in a simple high bun and dressed with flowers. A Koo Yah (young boy) starts the ceremony by running through some rituals with some items. After paying respect to the bride, he will hand her a Tong Shu (Chinese Almanac) filled with a pair of scissors, comb, ruler, razor, scale and red thread. A mirror and a basin of water with sprigs of ixora tied to long spring onions for blessing are also present. The Koo Yah walks around the brides few times to bless her with the items before placing a red thread on her head. By now, her hair has been cleared of pins and flowers to make way for her wedding headgear. The headgear is a sight to behold. Constructed of gold and silver intricate flowers, the crown is tightly secured to her hair while a belted head gear designed to match the crown and set with The Eight Immortal Chinese deities is placed around her forehead before a pair of fine flower pins are neatly placed and secured on her head. The Koo Yah finishes off the ceremony and the bride now gets to change into her wedding attire. First, a net like clothing is put on her and her necklace is removed to make way for another masterpiece. Her wedding dress, known as a Kuah, is a two piece costume, one with a long dress coat with long sleeves and a long A-line skirt. Both the wedding pieces are extremely intricate with loads of fine embroidery usually hand stitched with gold or silver thread. The colors are usually red and contrasted with other colors to give a vibrant color theme. A shelled overlay is then placed on the dress coat to add on further effect to the grandeur of the wedding pieces. Once the dressing is completed, the parents of the bride will place the veil over the bride. This is my first time seeing a black veil on a bride. I can’t seem to find out why the veil is black for this matter. After this ceremony, all she has to do is to wait for the groom. I did notice the way the bride walks. She walks really slowly and sways side to side in a lady like manner. It’s pretty adorable and very feminine. I am not too sure but I saw some sites that also states that the groom also goes through this hair combing ceremony. Anyone care to confirm this? We were in a TV commercial once - advertising weddings in Malaysia - one of them was a Peranakan wedding. Very interesting post - wish I were there to watch this... I see some Sarawak Iban costume in the background too in one of the pics. Great event! That is an excellent experience, and 12 days of Wedding celebration !!!!! This is a special and rare occurence showcasing a wonderful synergistic culture.Congratulations to the organisers. henna design is the art of painting the hands or feet, or even the body, with a paste made from dried henna leaves. It creates a stain that ranges from bright red to a dusky brown, but this color is prone to fading with time and strength and quality of the paste you make. Oils can be added to help the richness of the shade, but are not necessary. After the euphoria of getting engaged has worn off, it's time to start focusing on how to plan for the big day. Where do you begin? You will need a wedding timeline to help you organize and manage all of your Nana Unikorn planning. Discover how to create your own timeline based on the amount of time you have before your wedding and learn when you should do what in order to pull off the perfect wedding.